I've been around for sixty-five years. Rapidly approaching little old manhood. Was I born to this? Looking back at my life, it seems to have been inevitable. Connie, you must be putting your true self in these; you're definitely getting me right. I'm 73, and I'm comfortable with myself for the first time. 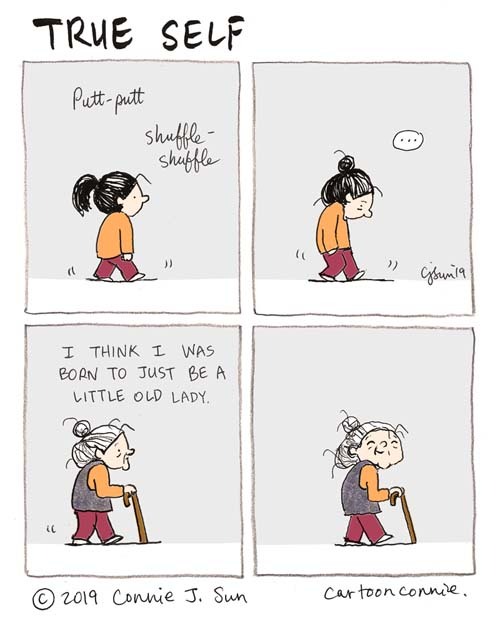 Also I'm 4'10", so I was definitely "born to just be a little old lady". In my early teens I was often accused by classmates of acting like an old lady. Now I nearly am one, and I like myself very much. I can't wait to be an old lady. Hi Connie. I remember my last comment to your post was 31st December 2018. I moved to New Jersey next day. Work transfer. The last few years I have always imagined that maybe if and when I travel to East coast, I'll look you up. So, here I am and I hope to see you. Glad to be back on your page.